Two Left Needles : More nesting? Perhaps the second part of nesting, for me, has been picking up lovely yarns and fibers to surround me. I'm under the delusion that, during the weeks I'm home, not working, I'll have time to knit. 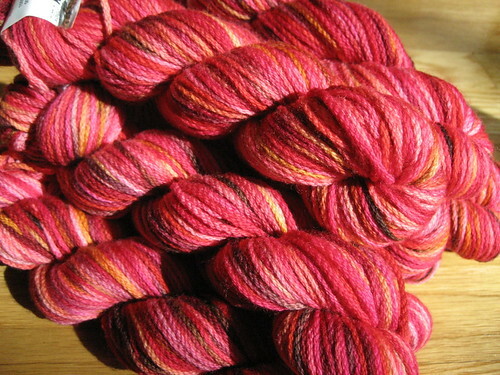 Rowan Calmer; more baby knits? Many (all?) 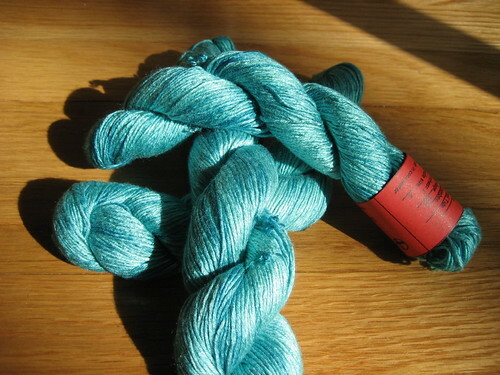 of these yarns fall into the luxury category that I couldn't justify in the past; but at more than half off, how could I resist? I want to dive in and start new projects left and right; but I'm ever aware of my WIP count and have some projects to finish up first. More soon! darn! 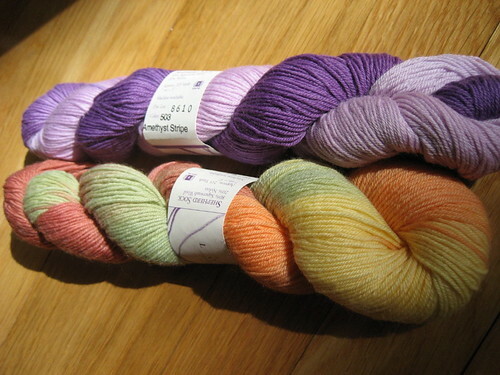 i really need some lorna's laces sock yarn and i keep missing the sales. of course, it would help if i was a shopper . . .
Great new stash. You may have time to knit. However, you will try to use that time to sleep. I wish you a good sleeping baby, so you can get your knitting done. Happy nesting! You got some beauties there. But I don't think yarn purchasing is really nesting, dearie. Yep! 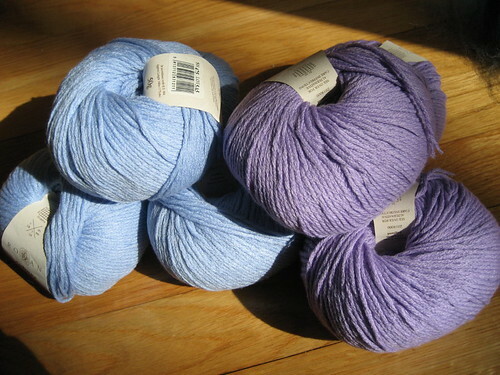 I carried off two skeins of DK cashmere that I NEEEEVER would have bought for $35 a skein - but for $16?? Why didn't I buy ten?? love the calmer - i've never tried it, but those colors are beautiful!!!!! Lorna's Laces! Regal silk! You lucky duck. Wonderful way to channel your nesting instincts! So glad I was oblivious to that sale - dangerous! Wow! Beautiful stuff. That does seem directly nesting...like when the birds line theirs with soft stuff. AAAAARGH! I immediately clicked the link for Knit Happens, saw the prices and began frantically clicking "Add to Cart" like a lunatic, and EVERYTHING IS SOLD OUT! I cannot even begin to express my disappointment and dismay. 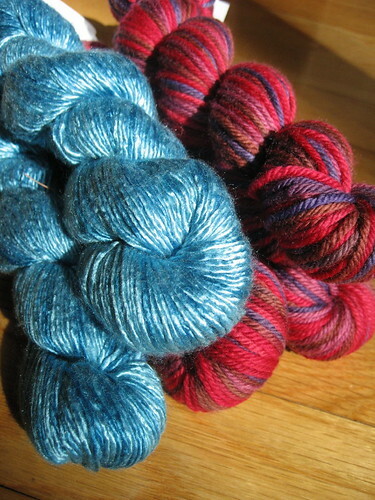 I'm going to go hide in the yarn closet and try to soothe myself with wool fumes. I love the amethyst Lorna's Laces! Baby knits are soo addictive. I'm finishing up all my WIP's so I can do a matching father/son sweater project. I certainly hope you have more luck knitting after the baby is born than I have had! I find it very very hard to put little Phil down in favor of my knitting. Lately his daddy has begged for more baby-time, though, so I am slowly getting back to it! Tuesday, April 10, 2007 12:12 PM by Beth S.
Luxury is all that knitting should be about if you ask me! Go for it!!! A great way to prepare for a new baby.......yes I see it as nesting....making a soft luxurious nest. Hmmm, no posts since Sunday... Is someone a new mom?? ?